At the Santa Barbara Bowl, Saturday, September 13. Stone Temple Pilots frontman Scott Weiland. 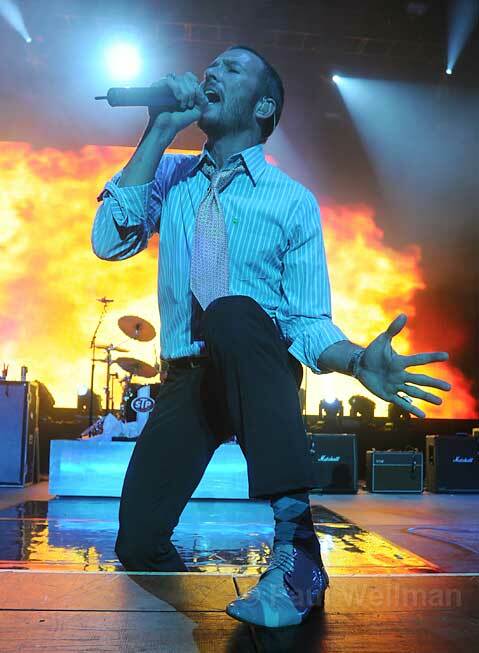 Cheers aplenty, it was roughly 20 minutes before a thin-but not as thin as before-Scott Weiland bounced onto stage wearing tight black skinny jeans, a white blazer, shirt and tie, fedora, and a pair of sunglasses. He led his Stone Temple Pilots into the first song (“Big Empty”) of what would become a night full of the sonic relics of a bygone era. Swinging his shoulders from side to side in the signature dance move he’s had the past 15 years to perfect, Weiland was joined by the thousands before him-most of whom sang along enthusiastically without missing a beat. 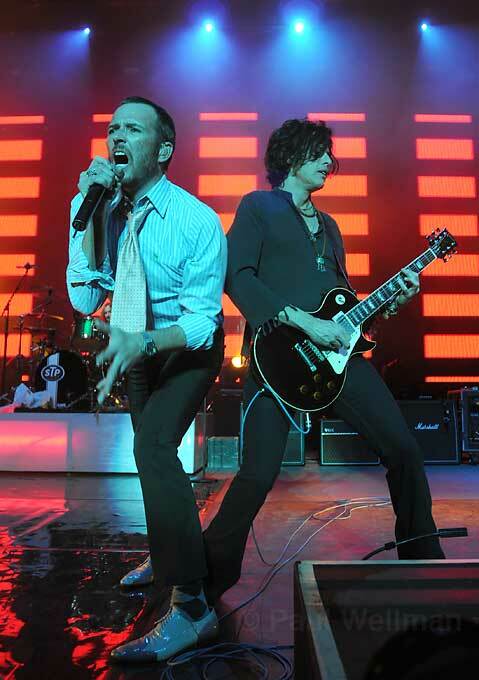 STP frontman Scott Weiland (left) belts through the hits with guitarist Dean DeLeo during last Saturday's tour-closing show. The night was a gleaming success. Between a very animated (and at times, slightly pornographic) projection show that illuminated the entire backdrop of the stage, a barrage of hits, and hundreds of cell phones capturing pictures and video of Weiland on stage, the long term success of STP was obvious. All around people were talking about “this time in high school” and “that time in college,” making the show seem like a piece of ’90s rock history. This was further evidenced as their set went on, as almost every song they played had, at one point, been a highly recognizable single from the past decade-and-a-half.